The Bhagavad-gita is highly recommended for anyone interested in spirituality and the meaning of life. One of the world’s best known literatures, it is often considered the essence of all wisdom. It’s a conversation between the military hero Arjuna and his friend/advisor/charioteer Krishna, spoken just before the apocalyptic Battle of Kurukshetra. Subjects they discuss include the eternality of the self, destiny, the source of our being, and how to achieve genuine, long-term peace and happiness. The translation and commentary by His Divine Grace A.C. Bhaktivedanta Swami Prabhupada, the twentieth century’s foremost Vedic scholar and teacher of Krishna consciousness, make Krishna’s teachings in the Gita accessible to the western reader. Prabhupada’s faithfulness to the original Sanskrit text, along with his straightforwardness, clarity and wit, make “Bhagavad-gita As It Is” true to its title. 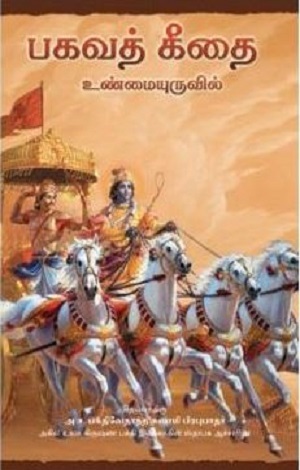 Since its publication in 1970, Bhagavad-gita As It Is has become the most widely read edition of the Gita in the world.